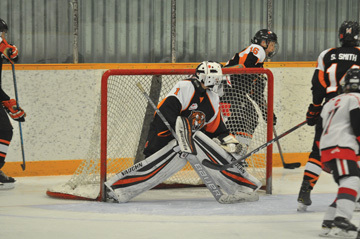 Commentator/Courier Photo by Justin Seward MVP: SEAC Tigers goalie Bodee Weiss has his head on a swivel as his defenceman gets out of the zone during the consolation game against the Balognie Prairie Storm on Sunday at the Kinplex. The black and orange won 6-1. The 46th annual Hockey Hounds Major Bantam Hockey Tournament hosted some of the top 13 and 14-year-olds from all over Western Canada in Medicine Hat over the weekend. For Bow Island native and South East Athletic Club (SEAC) bantam AAA Tigers goalie Bodee Weiss, the tournament was chance to put his best foot forward in front of many WHL scouts and his teammates, which paid dividends because he earned the SEAC team most valuable player award. “I’m honoured to be selected for that and thankful for Bobby Fox (Medicine Hat Tigers director of player personnel), who chose me,” said Weiss.He also received a congratulatory texts from now Los Angeles Kings interim head coach Willie Desjardins on the award. The Tigers had a strong showing at this year’s tournament and had a 1-2 record in the round robin and a perfect 2-0 in consolation play. The tournament hosts opened up with a 4-2 loss to the Martensville Maurauders on Thursday, before ambushing the Swift Current Broncos 9-0 on Friday. The Calgary Edge would brush the black and orange 3-1 in the late game. On Saturday, the Tigers regrouped and beat the Churchill Warriors 3-0 before and ended off the tournament with a 6-1 win over the Balgonie Prairie Storm on Sunday. “I think we have a really good put together team,” said Weiss. The pace is a lot faster and harder shots is the difference for him going from the AA to the AAA level. “I just got to work on my angles and support the team a little bit and we’ll bundle some wins,” he said. Head coach Jason Bartram was encouraged with his teams effort moving forward into the rest of the season. “We felt like we outplayed everybody we played,” he said. Weiss is steady all the time, he said. “Him and Kaiden (goalie Morin) always give us a chance to win. They both work hard. They’re both competitive and want to win,” said Bartram.